Weather conditions in the Adriatic are affected by the general weather situation in the Mediterranean and local climate conditions. Generally speaking, light to moderate winds with few storms prevail until June. In July and August, a period of calm sets in and storms are more frequent. From September on winds are again stronger. The bura (bora) and the jugo-siroco (jugo-scirocco) are the main winds on the Adriatic . They prevail in the winter period from September to May. The prevailing wind in the summer is the maestral. The bora is a cold and dry north-easterly wind. It blows from the continent, i.e. from the eastern side of the Adriatic towards the open sea and brings bright weather. It starts abruptly and blows in squalls toward the sea. It is strongest in the Velebit Channel and the Gulf of Trieste . 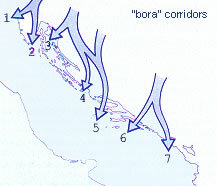 Picture shows typical "bura" corridors: (1) Golf of Trieste, (2) Kvarner, (3) Velebit Channel, (4) Sibenik, (5) Split - Makarska, (6) Peljesac and (7) Dubrovnik . In the summer the bora blows as a local wind and then lasts only a few days. In the winter it may continue for six to fourteen days. The jugo is a warm, humid east-southeast wind. It is accompanied by heavy clouds and rain. It is not a sudden wind like the bora but takes 36-38 hours to develop. It blows throughout the Adriatic . In the summer it may appear as a local wind and is more frequent in the southern part of the Adriatic . Between March and June it blows in the north as well. The maestral is a local wind which blows from the sea, mostly in the summer. It usually starts between 10 and 11 in the morning and reaches its greatest strength between 2 and 3 in the afternoon to die down at sunset. It brings good weather. It is usually accompanied by white clouds. The burin, a north-easterly, blows in the summer from the mainland. The tramontana is a type of bora; it is a northerly. Another type of bora is the easterly levante. Pulenat blows from west and lebic from south-west. The nevera, a violent westerly, comes as a storm or squall. In the summer months, storms in the Adriatic are sudden and violent and produce a short-lasting swell. The Adriatic storms have an advantage: they do not last long and some of them leave behind pleasantly cool air. During periods of high pressure, the Adriatic also has the classical rhythm of winds: winds from the land during the night and from the sea during the day.